Surveillance against cells undergoing tumorigenesis [5-9] or infection by viruses [10,11] or internal pathogens [12,13] is provided by natural killer (NK) cells, components of the innate immune system, thus helping to provide "covering fire" during the period that responses by the adaptive immune system are gearing up . 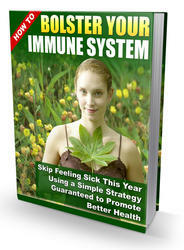 NK cells also act to regulate innate and acquired immune responses through the release of various immune modulators, chemokines, and cytokines, such as tumor necrosis factor a, interferon y, MIP-1, and RANTES. Unlike T cells, NK cells function through a diverse array of cell-surface inhibitory and activating receptors. 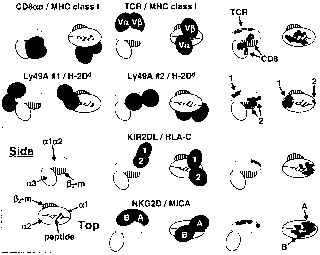 Many NK cell surface receptors (NCRs) are specific for classical (such as HLA-A, -B, and -C in humans) and nonclassical (such as HLA-E in humans) MHC class I proteins and occur in paired activating and inhibitory isoforms [15-17]. Different NCRs, with different MHC class I specificities, are expressed on overlapping, but distinct, subsets of NK cells in variegated patterns—where the strength of the inhibitory signals may be stronger than stimulatory signals. Figure 1 Schematic representations of structurally characterized NK receptor-ligand complexes. Each row shows two views of a receptor-ligand complex, first showing the organization of domains in the complex (receptor domains in black, labeled where a distinction between domains is significant; MHC class I ligand heavy chains in white and p2-m in vertical stripes). The arrangement of domains in the ligands is detailed in the inset; the approximate solvent-accessible surface area of the bound peptide, if present, is shown as a cross-hatched area. The right-most columns show approximate footprints of receptors and coreceptors on the ligands as black patches, labeled by receptor component, subsite, or domain, as appropriate. Thus, NK cell effector functions are regulated by integrating signals across the array of stimulatory and inhibitory NCRs engaged upon interaction with target cell surface NCR ligands [16,17], resulting in the elimination of cells with reduced MHC class I expression, a common consequence of infection or transformation . Other NCRs, such as human and murine NKG2D, recognize divergent MHC class I homologs (ULBPs , MICA, and MICB in humans , and RAE-1 and H60 in mice [21,22] not involved in conventional peptide antigen presentation. 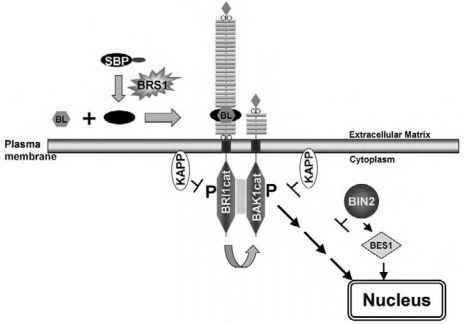 Inhibitory receptors transduce signals through recruitment of tyrosine phosphatases, such as SHP-1 and SHP-2, and contain immunoreceptor tyrosine-based inhibitory motifs (ITIMs) in their cytoplasmic domains [23,24]. Activating receptors associate with immunoreceptor tyrosine-based activation motif (ITAM)-bearing adaptor proteins, either DAP12  or DAP10 [26,27], through a basic residue in their transmembrane domain. Natural killer cell surface receptors can be divided into two groups based on structural homologies [28,29]. The first group includes the killer cell Ig receptors (KIRs) and consists of type I transmembrane glycoproteins with ectodomains containing tandem Ig domains. The second group, including the rodent Ly49 receptor family and the CD94/NKG2 and NKG2D receptor families found in primates and rodents, comprises homo- and heterodimeric type II transmembrane gly-coproteins containing C-type lectin-like NK receptor domains (NKDs) . NCR/ligand dissociation constants range from a hundred micromolar to tens of nanomolar (see Table 1). A series of recent results from X-ray crystallographic analyses detail the interactions for a number of NCR/ligand complexes. Two crystal structures of complexes between inhibitory KIR family NCRs and their MHC class I ligands, KIR2DL2/ HLA-Cw3  and KIR2DL1/HLA-Cw4 , show that the receptor binds in a 1:1 complex with HLA-C, making contact with both the a1 and a2 platform domains and the carboxy-terminal end of the bound peptide (see Fig. 1). (KIR receptor nomenclature identifies the number of Ig domains [2D(omains) or 3D, specific for HLA-C or HLA-B respectively], and whether the receptor is a long [L] form, containing ITIM repeats, or a short [S] form, interacting with ITAM-containing adaptor proteins.) Both complexes have interfaces showing both significant shape and charge complementarity, with the N-terminal KIR domains interacting primarily with the a1 domains of HLA-C, the C-terminal KIR domains contacting the a2 domains, and additional contacts provided by the interdomain KIR linker peptides (the "elbow"). The kinetics of binding, rapid on and off rates, are consistent with interactions dominated by charge-charge interactions. Despite a high degree of conservation of binding surface residues between both KIR2DL2 and KIR2DL1, and HLA-Cw3 and -Cw4, few actual intermolecular interactions are conserved. This recognition flexibility is accomplished through altered side-chain conformations. KIR2D receptors distinguish between HLA-C allotypes on the basis of the residue at position 80; KIR2DL1 recognizes lysine and KIR2DL2 recognizes asparagine, and this specificity is conferred by the identity of the residue at position 44 in the receptor. In KIR2DL1, Lys80 is shape and charge matched to a distinct pocket on the surface of the receptor; while Asn80 is sensed through a direct hydrogen bond in the KIR2DL2 complex. N-terminal end of the bound peptide—the opposite end from where KIR2D binds. The second binding site positions Ly49A in the cleft between the underside of the platform domain (the top being the peptide and TCR binding surface), the a3 domain and P2-m. The second site is considerably more extensive than the first site, though less shape complementary and less dominated by charge-charge interactions, and is likely to be the immunologically relevant interaction on the basis of subsequent mutagenesis studies. The second site also overlaps the CD8 binding site on MHC class I proteins. As predicted, Ly49A clearly displays a C-type lectin-like fold, though failing to retain any remnant of the divalent cation or carbohydrate binding sites conserved in true C-type lectins. While the simplest binding mode for a symmetric homodimer is to interact with two monomeric ligands through two identical binding sites, each Ly49A interaction with Dd is with a single monomer because binding of ligand at one site steri-cally blocks binding at the second, homodimer-related site.